The method of determining period operating results in Profitability Analysis is based on the assumption that a company's success can be measured primarily on the basis of its transactions with other companies. The aim is to supply the sales, marketing, product management, controlling, and corporate planning teams with decision-support information.This sales-oriented approach in CO-PA means that no contribution to the organization's success is made until a sales transaction has been completed. Consequently, the products sold are transferred to CO-PA in accordance with the cost-of-sales accounting method and provide information on the sales revenue and sales deductions. This net revenue is then compared with the cost of sales. These costs consist of the cost of goods manufactured of the products sold or services rendered plus any production variances known.To round off your profitability data, you can also assign overhead costs to profitability segments in the course of your period-end closing activities. 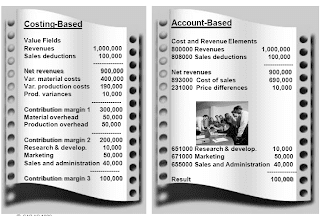 The value fields in costing-based CO-PA contain the amounts and quantities that you want to report on. 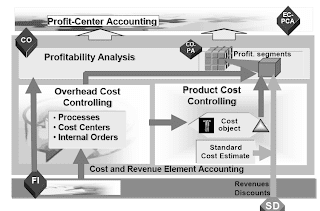 They represent the finest level of detail at which costs and revenues are broken down.One of the most important tasks in Customizing for costing-based CO-PA is to assign your costs and revenues to the desired value fields so that you can calculate the contribution margins that your organization requires in the information system. 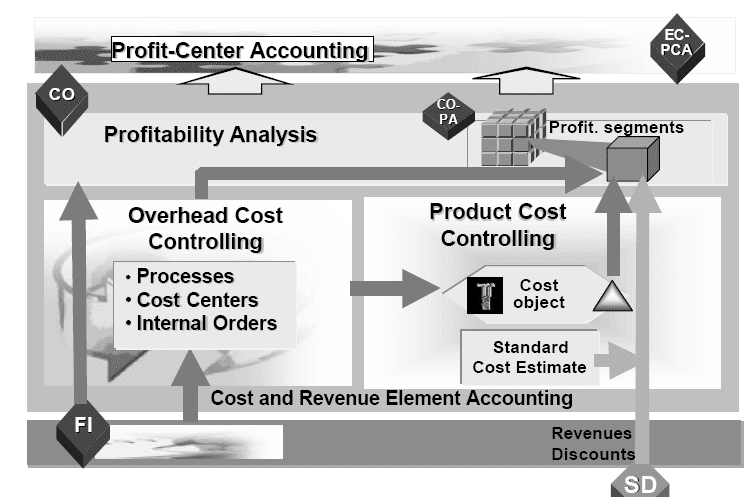 The interface with the Sales and Distribution (SD) application component plays a central role in Profitability Analysis. 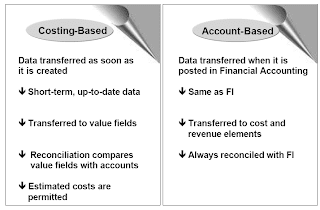 In particular, note the differences in when data is transferred to costing-based and account-based CO-PA.The main purpose of costing-based CO-PA is to provide sales management with a tool for analyzing the expected results generated by sales transactions. Its main feature is the use of value fields and the automatic calculation of anticipated or accrual data (valuation). The advantage of this method is that the data is up-to-the-minute. Account-based CO-PA enables you to reconcile cost and financial accounting at any time at the account level. 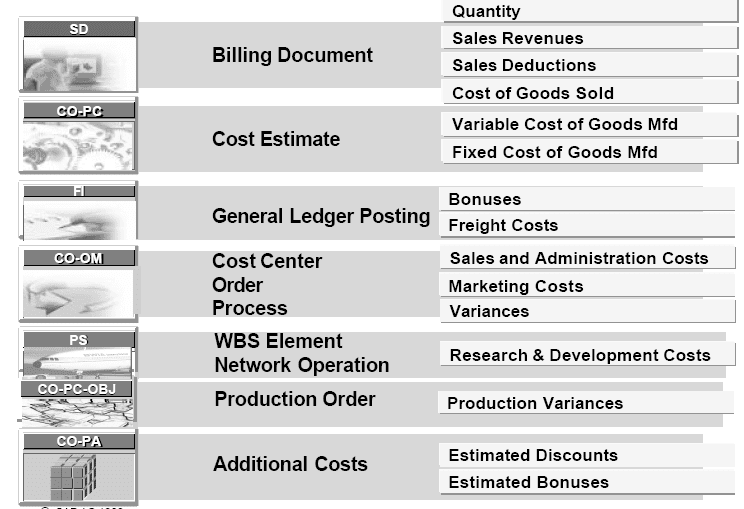 In contrast to costing-based CO-PA, here the system stores values in cost and revenue elements, which form the common account structure for all of the Financials applications. All costs and revenues are posted to account-based CO-PA simultaneously and using the same valuation approach as Financial Accounting. The main difference here is that the cost of sales is transferred at the point of goods issue and not together with the revenues. The Sales and Distribution (SD) application component comprises the functions for handling quotations, orders, deliveries, and billing. 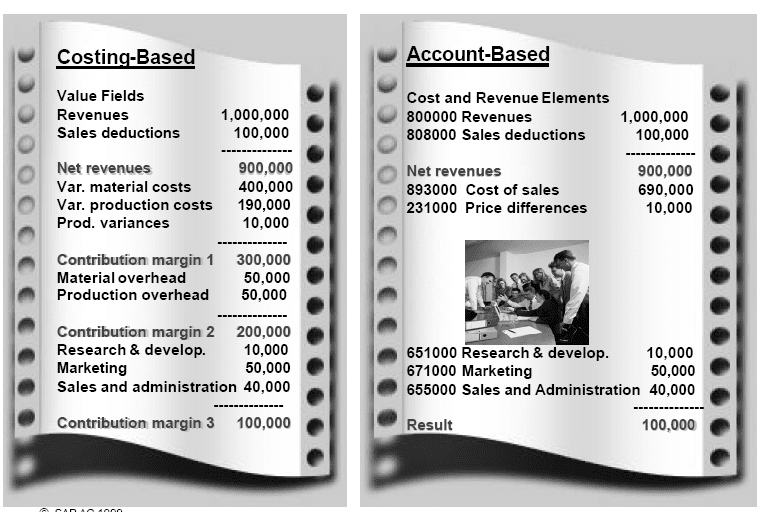 Each of these areas has its own sales documents which contain the relevant data for that activity.The central document in SD is the sales order. This order may be based on existing inquiries and customer quotations. When you create an order, information about the customer and the products or services sold is stored in the document.This information is passed on to all the subsequent documents created for this business transaction:  The delivery is created when the product is shipped to the customer (goods issue). A billing document is created to bill the customer for the goods or services provided.This is a central process in the R/3 System and the starting point for the data transfer to Financial Accounting and to Controlling. 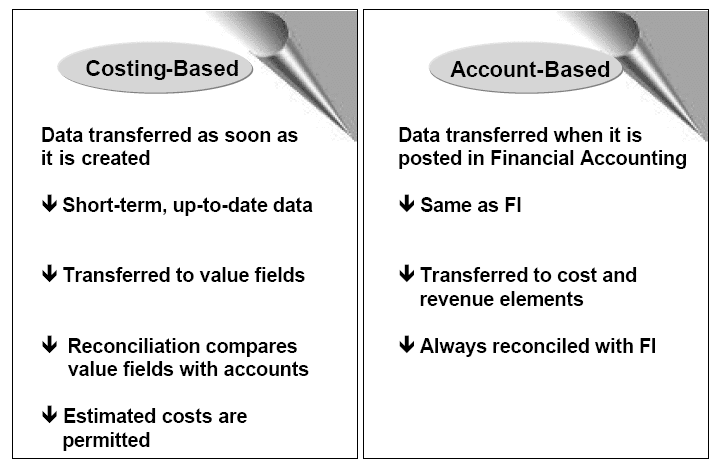 In some cases, the data is transferred to costing-based and account based CO-PA at different times and using different valuation approaches. A pricing procedure defines the conditions which are permitted for a particular document and the sequence in which the system takes these conditions into account during pricing. In addition, you assign the pricing procedures to the transactions by defining the following dependencies: Customer, sales document type or sales area. In the pricing procedure, you define which condition types should be taken into account and in which sequence. During pricing, the SAP System automatically determines which pricing procedure is valid for a business transaction and it takes the condition types contained in it into account one after the other. This option means that the orders are updated under the same period in which they were created in the system. This option means that the order appears in Profitability Analysis in the period of the planned delivery or the scheduled billing date. It thus comes closer to reflecting the expected billing information.If you activate Profitability Analysis after you have gone productive with SD, you can post existing sales orders for the current or past periods subsequently to CO-PA.Another function is available for identifying sales orders that are already assigned to a profitability segment (though the order was not yet active) and for transferring these orders to CO-PA. The goods issue is triggered by a delivery in SD. This affects the values in Materials Management and Financial Accounting. Balance sheet and stock change postings are made in FI when the goods issue is posted.Note that the goods issue posting does not cause any data to be posted in costing-based CO-PA. The cost of goods sold is only transferred to costing-based CO-PA when the billing document is transferred. A business transaction is usually concluded in SD with the billing document. The billing data is automatically transferred to FI, where the revenue and receivable postings are made at the same time. n When a billing document is created, SD calculates all sales revenues, sales deductions, and other values (such as the standard cost) using pricing procedures, and stores these values in condition types. 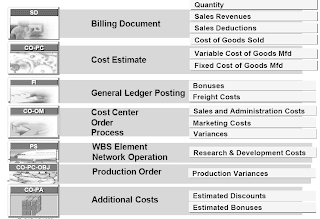 By assigning these condition types to the value fields in Profitability Analysis, you can have the system automatically transfer their values to CO-PA.
By valuating this billing data from SD using a material or sales order cost estimate, you can assign further anticipated costs and sales deductions to this transaction. The billing data is transferred to Profitability Analysis with record type F.Moreover, you can also transfer quantities from the SD quantity fields (such as the sales quantity or gross weight) by assigning them to corresponding quantity fields in CO-PA.
A condition type is a representation in the system of some aspect of your daily pricing activities. For example, you can define a different condition type for each kind of price, discount, or surcharge that occurs in your business transactions.A condition table defines the combination of fields (the key) that identifies an individual condition record. A condition record is how the system stores the specific condition data that you enter in the system as condition records. For example, when you enter the price for a product or a special discount for a good customer, you create individual condition records. n An access sequence is a search strategy that the system uses to find valid data for a particular condition type. It determines the sequence in which the system searches for data. The access sequence consists of one or more accesses. The sequence of the accesses establishes which condition records have priority over others. The accesses tell the system where to look first, second, and so on, until it finds a valid condition record. You specify an access sequence for each condition type for which you create condition records. Transfer the Material Value at time of good issue via condition VPRS  The condition type VPRS transfers the COGS posted at time of good issue to CO-PA. Even if the standard price was changed between goods issue and billing, VPRS saves this value and ensures that COGS can be reconciled with FI. Valuation using material cost estimates lets you determine the cost of goods manufactured for the product sold whenever a sales document is transferred to Profitability Analysis. For example, you can find the variable and fixed cost components for the product sold and compare these to the revenues and sales deductions transferred from the billing document for the sales transaction.It is possible to valuate your billing items using the date of goods issue. The customizing is done in the costing key.